Developed by the Australian Institute of Architects, 41X is a hub for architecture, staff, members and the general public. The building’s name is taken from its address at 41 Exhibition Street. 41X is a 22-storey Five Star Green Star strata-titled commercial tower. The building accommodates the Australian Institute of Architects’ Melbourne offices, including the Victorian Chapter, over four levels. The building’s sculptural exterior integrates the practicality of a commercial office tower with the more traditional chiselled masonry aesthetic of Melbourne’s public buildings. 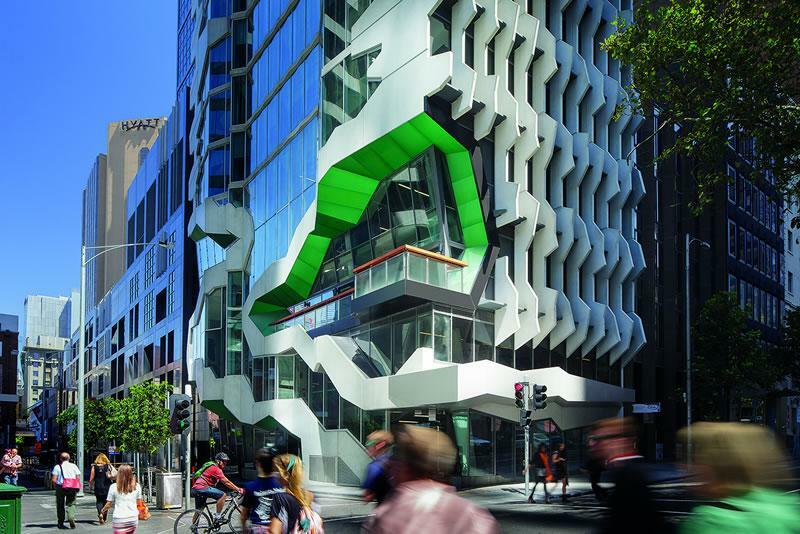 41X is the first strata commercial office building in Melbourne to target carbon neutrality over its 30-year operating lifespan, accounting for embodied energy, base building operational energy, transport and waste. Lyons teamed up with AECOM to devise solutions that took a holistic approach to a building’s carbon cycle. The team considered that a building, through its construction and operation, builds up a balance sheet of carbon that is displaced to the environment. The new approach considers the quantity of carbon that a building generates, seeks to reduce that carbon through design methods in the first instance, and if required, engages offsite displacement; the Total Carbon Metric.